The elegant Junior Suite has a king-size bed and a large living area with sofa, for those looking for more space during their stay. Effortless contemporary style is evident all around, from the extreme comfort of the king-size bed and selection of pillows to suit individual requirements, to the sleek modern bath boasting double sinks and walk-in showers, with some even having a separate bathtub. A bottle of locally sourced sparkling wine will greet guests at their arrival for a most relaxing stay. Step into this spacious suite and what catches the eye is the timeless design features like the ornate high ceiling and the balcony. Explore further to discover a stylish private king bedroom and a separate living room, complete with dining table, sumptuous sofa, microwave, bar cabinet, and wine chiller. Stay entertained and connected with two HDTVs and complimentary WiFi. When it is time to freshen up, there is a spacious bath with a separate bathtub and shower, and also a separate guest bath for complete privacy. There is a complimentary minibar, a special VIP welcome of locally sourced sparkling wine, and traditional Roman amenities to greet guests upon arrival. 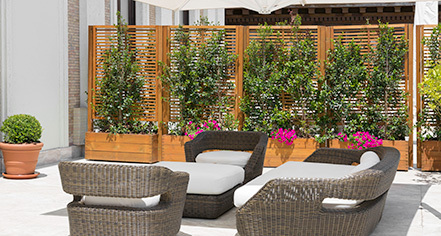 A uniquely designed suite with a style all of its own, the Barberini Suite opens into a large terrace complete with outdoor furniture. Inside, there is a collection of handpicked artwork throughout the suite. Further exploration reveals a stylish private king bedroom and a separate living room, complete with dining table, comfortable sofa, microwave, bar cabinet, and wine chiller. Guests have a world of entertainment and news at their fingertips with two 55-inch HDTVs and complimentary WiFi. When it is time to freshen up, there is a spacious bath with separate bathtub and shower, and for complete privacy, a separate guest bath. There is a complimentary minibar, a special VIP welcome of locally sourced sparkling wine, and traditional Roman amenities to greet guests upon arrival. A head for the high life is a prerequisite for the Basilio Suite. Thanks to its unique design, the suite is the perfect space for business meetings or top-level negotiations. It features an impressive boardroom table and a living space beyond for more informal gatherings. 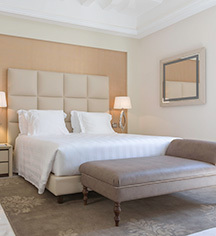 Guests also have the opportunity to take the adjoining private king bedroom for the ultimate flexible space to stay when visiting Rome for business and leisure. The suite includes complimentary WiFi, two 55-inch HDTVs, a luxurious bath with bathtub and shower, and a separate guest bath. Guests are greeted with a complimentary minibar, a special VIP welcome of locally sourced sparkling wine, and traditional Roman amenities. This suite is essentially an elegant home away from home. With its spacious, yet private king bedroom and a separate living room, complete with dining table, microwave, bar cabinet with wine chiller, and sofa, the Constantino is the ultimate in luxury. Entertainment is provided by two 55-inch HDTVs and complimentary WiFi. There are two baths, one is spacious with a separate bathtub and shower to relax and freshen up. There is a complimentary minibar, a special VIP welcome of locally sourced sparkling wine, and traditional Roman amenities upon arrival.